This range spreads out across a long wedge of parkland on the western side of Lake Dianci; its hills are also known as the 'Sleeping Beauty Hills', a reference to the hills' undulating contours, which are thought to resemble a reclining woman with tresses of hair flowing into the sea. The path up to the summit passes a series of famous temples. It's a steep approach from the north side. 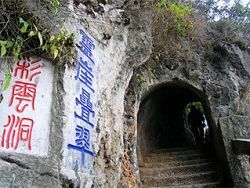 The hike from Gaoyao (gāoyáo 高峤) bus station, at the foot of the hills, to Dragon Gate takes 3 hours, though most people take a connecting bus from Gaoyao to the top section, or take a minibus direct to the Tomb of Nie Er. Alternatively, it is also possible to cycle to the hills from the city center in about an hour. To vary the trip, consider doing the return route across the dikes of upper Lake Dianci. 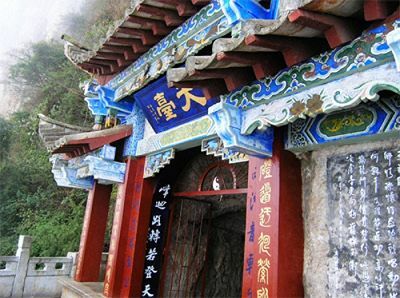 At the foot of the climb, about 15 km from Kunming, is Huating Temple, a country temple of the Nanzhao Kingdom believed to have been constructed in the 11 th century, rebuilt in the 14 th century, and extended in the Ming and Qing dynasties. The temple has some fine statues, a Buddhist scripture library, and excellent gardens. The road from Huating Temple winds 2 km from here up to the Ming dynasty Taihua Temple. The temple courtyard houses a fine collection of flowering trees, including magnolias and camellias. Farther along the road, near the minibus and cable car terminus is the Tomb of Nie Er. Mr. Nie Er coposed the national anthem of China. From here you can catch a chairlift if you want to skip the fairly steep ascent to the summit. Alternatively a tourist tram takes passengers up to the Dragon Gate. You can also catch a cable car here down to Haigeng Gongyuan and Yunnan Nationalities Village. 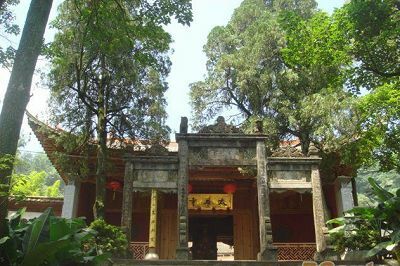 Sanqing Ge (Sān qīng gé 三清阁), near the top of the mountain, was a country villa of a Yuan dynasty price, and was later turned into a temple dedicated to the three main Taoist deities. Farther up, near the top of the mountain, is Dragon Gate. This is a group of grottoes, sculptures, corridors and pavilions that were hacked from the cliff between 1781 and 1835 by a Taoist monk and co-workers, who must have been hanging up there by their fingertips. At least that's what the locals do when they visit, seeking out the most precarious perches for views of Lake Dianci. The tunnel along the outer cliff edge is so narrow that only one or two people can squeeze by at a time, so avoid public holidays and weekends! 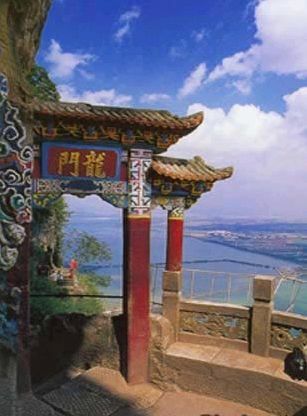 This tower and Dragon Gate are the most magnificent scenic sights in Kunming. The Three Purity Tower (Sān qīng gé 三清阁) seems suspended in midair on the steep Arhat Cliff. From a distance, it looks like a jade tower in heaven. 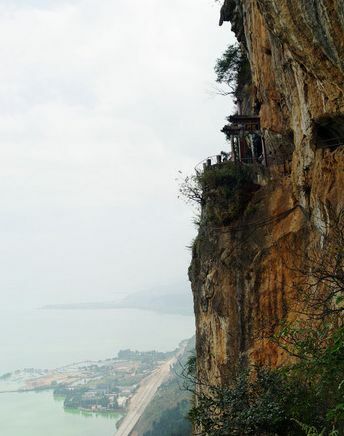 More than a thousand stone steps lead from the tower to Dianchi Lake; the cliff is therefore also called Thousand Steps Cliff. From the top of Three Purity Tower the boats on Dianchi Lake look like mere specks. Few people who have got as far as Three Purity Tower would give up the opportunity to climb the Dragon Gate (lóng mén 龙门). The gate was built during the Qing Dynasty by a poor Taoist priest, Wu Laiqing, and his friends, using simple tools. It consists of three stone chambers chiseled out of the cliffs and connected by a spiraling passageway that allows only one person to pass at a time. The passage ends at the Pavilion Leading to Heaven (Datiange). A stone archway was built at eh entrance with the inscription Long Men (Dragon Gate) at the top. The view of Dianchi Lake below is a thrilling sight from this breathtaking building on the cliff. The Western Hill Park is located 16 km southwest of Kunming. You can either take a taxi for 30 RMB or Bus no. 6 or 51 to get there.